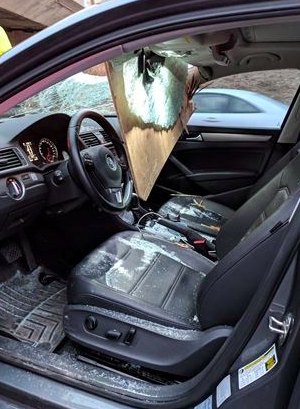 [MUST SEE PHOTOS] Two People Lucky to be Alive After Scary Incident on Brampton Highway. In a scene directly out of 'Final Destination' an unsecured load sent a piece of plywood directly through a couple's windshield on busy highway. Brampton, ON - Two people have been taken to hospital after a horrifying incident on the 410 yesterday just before rush hour. 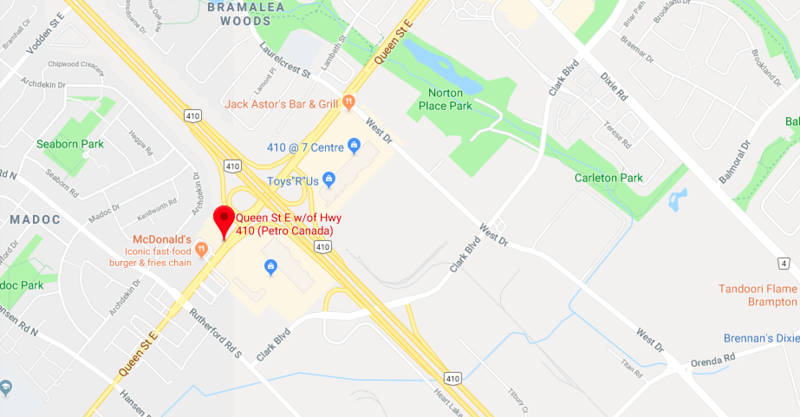 about 4pm near Queen Street East (see map below) a large piece of plywood from an unsecured load flew off the back of a truck and crashed through the windshield - narrowly missing the occupants. “It could have been fatal,” OPP Sgt. Kerry Schmidt said. “They are lucky to be alive.” That luck saw a man and a woman taken to hospital with only minor cuts and bruises in an incident that could have been so much worse. The driver carrying the unsecured load fled the scene, but a bystander was able to jot down the vehicle's license plate information and has passed it on to investigators. An arrest will hopefully be made soon. According to the Ministry of Transportation, drivers are responsible for making sure the load is evenly balanced and properly secured against shifting. Any cargo that breaks loose or shifts during a sudden stop or sharp turn could cause a collision. All loads carried on a motor vehicle or trailer must be bound, covered or otherwise securely fastened or loaded such that no portion of the load can fall off the vehicle or trailer. 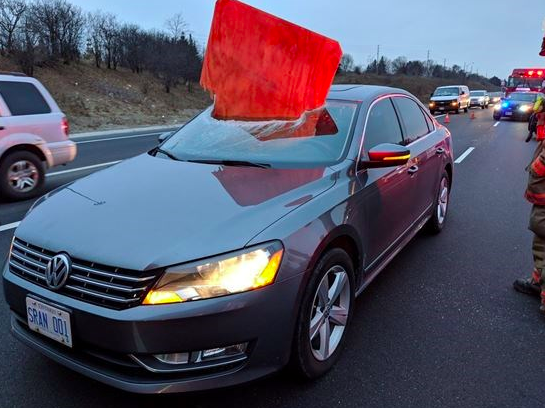 The Highway Traffic Act of Ontario also states that any load overhanging the rear of a vehicle by 1.5 metres (5 ft.) or more should be marked by a red light when lights are required (one-half hour before dusk to one-half hour after dawn or at other times of poor light conditions) and, at all other times, by a red flag or red marker. These regulations are put in place to keep all drivers on the road safe from flying debris. Headed on the road? Secure your load!